William Patrick Roberts, the second of the four children (three sons and a daughter) of Edward Roberts, a carpenter, and his wife, Emily Collins, was born in Hackney, London on 5th June, 1895. Roberts left school at the age of fourteen and became apprenticed to a poster-designing and advertising firm. At the same time he attended evening classes at St Martin's School of Art. In 1910 Roberts won a scholarship to the Slade School of Fine Art. David Boyd Haycock, the author of A Crisis of Brilliance (2009), described Roberts as "a gifted but scruffy schoolboy of fifteen." Roberts joined at the same time as Paul Nash. Other students included Edward Wadsworth, Christopher Nevinson, Mark Gertler and Stanley Spencer. The art critic, Ronald Alley, has argued: "Whereas his early drawings of 1908–9 show the influence of Italian old masters such as Michelangelo and Tintoretto, he began by 1912 to simplify his figures in a more modern, block-like manner and give his compositions an energetic, rhythmical design... Roberts's interest in cubism was further reinforced by a visit to France and Italy in the summer of 1913." In 1913 Roger Fry established the Omega Workshops. Other artists involved included Roberts, Percy Wyndham Lewis, Vanessa Bell, Duncan Grant, Henri Gaudier-Brzeska, Edward Wadsworth, Frederick Etchells, Henri Gaudier-Brzeska, Edward Wadsworth and Frederick Etchells. Roberts decorated table-tops and lampshades with cubist designs. Fry's biographer, Anne-Pascale Bruneau has suggested that: "It was an ideal platform for experimentation in abstract design, and for cross-fertilization between fine and applied arts." Roberts, along with Percy Wyndham Lewis, Frederick Etchells and Edward Wadsworth became disillusioned with the leadership of Fry. Richard Cork has pointed out: "He (Lewis) executed a painted screen, some lampshade designs, and studies for rugs, but his dissatisfaction with the Omega soon erupted into antagonism. No longer willing to be dominated by Fry, Lewis abruptly left the Omega with Edward Wadsworth, Cuthbert Hamilton, and Frederick Etchells in October 1913. By the end of the year he had begun to define an alternative to Fry's exclusive concentration on modern French art." This new movement became known as Vorticism. In his journal, Blast (1914-15), Lewis attacked the sentimentality of 19th century art and emphasized the value of violence, energy and the machine. In the visual arts Vorticism was expressed in abstract compositions of bold lines, sharp angles and planes. Others who joined this movement included Roberts, Christopher Nevinson, Henri Gaudier-Brzeska, David Bomberg, Jacob Epstein, Edward Wadsworth and Alvin Langdon Coburn. In 1914 Roberts contributed to the vorticist exhibition at the Doré Galleries. His biographer, Ronald Alley, has argued: "His principal works of this period have unfortunately disappeared, but it is clear from photographs and surviving studies that his vorticist style was radically cubist and sometimes almost abstract, with an emphasis on densely packed, angular machine-like forms and strong colours." In March 1916 Roberts enlisted in the Royal Field Artillery as a gunner. He saw active service on the Western Front. 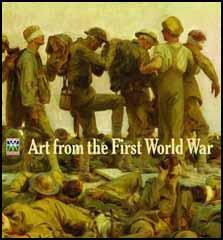 In April 1918 he was recalled to England to become an official war artist for the Ministry of Information. Paintings produced during the war included The First German Gas Attack at Ypres, Burying the Dead After a Battle, A Group of British Generals and A Shell Dump. In 1922 Roberts married Sarah Kramer (1900–1992), daughter of the painter Max Kramer and a sister of the painter Jacob Kramer, who had been a fellow student at the Slade School of Fine Art. They had one one son, John. Sarah served as a model for most of his portraits. During this period he began teaching at the Central School of Arts and Crafts in London. In 1923 he had his first one-man show at the Chenil Galleries. Ronald Alley has argued: "The main characteristics of his work were already apparent. A recurrent feature is his emphasis on the human figure and, above all, on groups of people all engaged in some specific activity such as playing chess, sunbathing, or riding bicycles - the kind of occupation that was an everyday occurrence in the parts of London where he lived (particularly in the area of Camden Town and Regent's Park). There is a strong element of humorous, sometimes sardonic, observation and the grotesque - for instance, in the grimacing faces and gesticulating hands - but this is combined with a classical concern with design and structure, so that every form has bold colours and a firm outline; and the design, frequently crowded with figures, spreads right out to the edges of the picture. He began by making drawings and carefully finished, sometimes squared-up watercolours of these compositions, before embarking on the oils. His figures are often rather stiff and puppet-like and tend to have a rounded, tubular character." The art critic of The Daily Telegraph pointed out: "To some art-lovers William Roberts... may have seemed an impersonal observer of everyday life – particularly London life – except in his involved and richly humanistic portraits of his wife and son. It seemed as though he could convey his vision of the human condition only by stylising his tubular figures – Tubism rather than Cubism, and thus giving them universal as well as individual significance. By distancing himself in this way from naturalistic portrayal he invested his compositions with a classical quality intensifying their human impact and his own vision of the subject. This, like his unwavering determination to protect his personal privacy, gave his career as an artist power, continuity and immunity from fashion and changing taste." In 1956 Percy Wyndham Lewis had an exhibition at the Tate Gallery, entitled Wyndham Lewis and Vorticism. 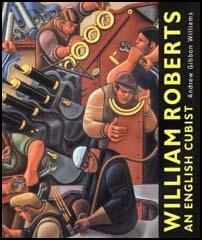 Roberts was furious with Lewis' claim that Roberts and the other vorticists were his followers. Roberts responded by publishing a series of polemical pamphlets, known as The Vortex Pamphlets. This was followed by further booklets, also published by himself, with photographs of his own works. A theme of his writing was the problems of making a living from his art. Despite his lack of success, he was given a large retrospective exhibition of his work in 1965. William Roberts died at the Royal Free Hospital in London on 20th January 1980. To some art-lovers William Roberts, who has died aged 84, may have seemed an impersonal observer of everyday life – particularly London life – except in his involved and richly humanistic portraits of his wife and son. It seemed as though he could convey his vision of the human condition only by stylising his tubular figures – Tubism rather than Cubism, and thus giving them universal as well as individual significance. By distancing himself in this way from naturalistic portrayal he invested his compositions with a classical quality intensifying their human impact and his own vision of the subject. This, like his unwavering determination to protect his personal privacy, gave his career as an artist power, continuity and immunity from fashion and changing taste. In his life, as in his art, he knew very early where he was going and kept his eyes steadily on his chosen road. Born in Hackney on June 5, 1895, the third child of Edward Roberts, carpenter, and Emma, formerly Collins – both Londoners – he began to draw almost as soon as he could hold a pencil. His craftsman-father encouraged him, and when the boy said he wanted to be a painter, made him and easel and a drawing board.